While the lamestream media holds public attention on GOP candidate rivalries, a “progressive” strategy is underway to eliminate the role of the states in electing a U.S. President. By transferring electoral votes to a “national popular vote” this “Compact” would usurp the role of the states as safeguarded by our Constitution. In doing so, it could also neutralize Obama’s critics — totally. This may be the most vital – and time sensitive - expose WAM has ever uncovered and shared! And it’s happening now, under the radar, with the general public in the dark. This “ultimate vote fraud” is intentionally complicated to keep it obscure until it’s too late to stop it. This complete expose on the “National Popular Vote Compact” won’t be found elsewhere. Because of the complexity and urgency of this issue. read it through completely. See who is behind this scheme and what its intended consequences are. Then spread the word in your blogs, forums and forward to all your contacts now. There is still time to block the NPVC sufficient states passage – only if we act now! All of US urgently need to contact our State Assemblymen, State Senators and Governors to vehemently oppose this covert measure! See below the real facts of this manipulation of the Constitution and American electorate. See Your State Status and action needed in last column. Called the “National Popular Vote Compact” this movement has been in the works nationwide – without public attention – on a state-by-state level since at least 2008. Once enough states have passed the NPVC bill into law to reach the requisite 270 Electoral Votes (by totaling the EV’s of those states which pass this bill) the NPVC goes into immediate effect in the next – and all subsequent – Presidential elections. It doesn’t matter how strongly other states oppose this. We’d all have to go along, if even a minority of states pass it! • Currently, this bill has passed enough state houses to reach more than 160 EV’s – so they are well over half way to their goal right now. According to most up-to-date information this National Popular Vote Pact has already passed 1 of the 2 required chambers in more than 30 other states- without public attention. If their magic number of 270 EV totaling states is reached, it won’t matter how the rest of the states vote on this; nor whether other states never take up the bill; not even if other states vehemently object and oppose this action. It would be the Law of the Land! This sneaky scheme to upend Constitutional rights and protections of all states and their residents in selecting the nation’s leader is underway as an explicit attempt to defeat the careful Constitutional amendment process with no public knowledge, no voter input, no public referendums and no input from states which object to this measure. All NPVC takes is a portion of current state houses to make it law for all of us – always! Why would progressives want to switch to a National Popular Vote POTUS? Do the math: The electoral vote system protects voting rights by giving every individual state a number of electoral votes representing the level of population. In this way, all states in the Union have a proportionate and representative say in who becomes President. It doesn’t matter if the state has more land mass than populace, or if more of the people live in rural areas, etc. 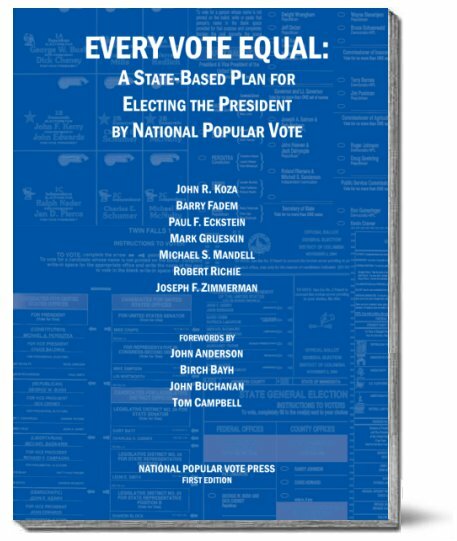 Here is what would happen with an NPVC that hands all the needed 270 Electoral Votes to the national popular vote winner: Those states with larger populations – especially those with heavily populated big cities will pick the President. Period. The politically savvy know that big city voters trend “Democratic” – and that controlling big city vote results (by buying votes, duplicating votes, “fixing” vote count machines on a large scale basis – these are all “Democratic” party specialties! Take Illinois as a case in point. No matter the notorious corruption in politics there. Year after year, all the suburban and rural vote populations together can’t get their voices heard to change who runs the state. Why not? Because the votes of the city of Chicago always outnumber the total combined votes in the entire rest of the state. Is that what we want to happen to the White House? The state houses of Illinois, California, New York and New Jersey – with their large combined Electoral Votes – are among those that have already passed the NPVC into law. A list of states which have passed this treacherous law is given below. Do you think the voters in those states (of which you may be one) have an idea this has happened? Of course not – as with all Progressive take-over tactics, this one is being arranged as quietly and quickly as possible, before the actual voters there even find out! So, if you’ve wondered why Obama isn’t more worried about his “re-election” – despite growing public dissatisfaction – now you know. Just pass the NPVC in a handful more states. Then, put the usual paid workers out in the precincts with lies and pockets full of bribes for votes; send out more union propaganda enflaming and threatening union members into support; continue using state paid staff to bring in the votes of the infirm and institutionalized; doctor up more absentee vote records; alter the vote totals of machines in key areas. And voila – Obama gets even the tiniest combined margin of the “popular” vote (by hook or crook) – and he stays in office! If this NPVC vote scam gets enough states to go along, the rest of US are doomed to non-elect but appoint Obama again – by the magic 270 with claims that its all very constitutional! Akin to ObamaCare, if this National Popular Vote Compact is passed – no matter how wrong and corrupt – it would take massive funding and endless delays to drag through the courts in hopes of any reversal. An NPVC success in its remaining targeted states would mean: states that have been trending GOP and don’t support NPVC won’t matter; states with large land expanses sprinkled with Conservative voters and rural farmers won’t matter; suburbanites who pay the taxes that support city entitlements won’t matter; the original fair and balanced Electoral College system won’t matter. After all, they tell US: this is just one of those parts of that old Constitution that’s not really fair and needs to be updated! Here is a summary of why the National Popular Vote Presidency is a really bad idea. Who is behind the National Popular Vote Compact? 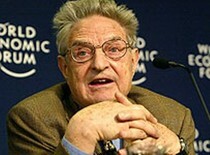 Summary: George Soros favorite game is taking over the politics (and governments) of countries. If you’re not familiar with hisbio, you should be. See here his role in the bogus movement toward a popular vote. Soros son, Jonathan, propaganized ”It’s’ time to junk the electoral college” all the way back in 2008. We know by know how their ilk uses long-term, heavily financed astro-turf “reform” movements – under cover of nice-sounding names, multiple websites and distorted messages to increase their public appeal. Here’s what the National Popular Vote movement wants you to believe. Their operatives began moving this Plan through state assemblies even before 2008 election. See an actual chart of the scope of Soros spiderweb of behind-the-scenes influence here. The National Public Vote Compact bill, promoted nationwide, came from this source in 2001. Since then, the same bill based on their strategy has been filed in states nationwide! 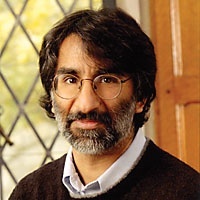 Akhil Amar has also “recently proposed that every American should be required to undergo a DNA test so that a national DNA database can be created.” Together this pair has made many other monstrous “legalese” proposals including how an “Instant Run Off System” could “remedy the flaws” in America’s voting system; term-limiting Supreme Court Justices and improving the Presidential line of succession in the event of “election terrorism.” By no strange coincidence, the brainstormer of this end-run to trick the public and the Constitution by a minority of favorable state lawmakers, Vikram, also keeps busy writing frequent legal articles in defense of the constitutionality of ObamaCare! Need we wonder who is financing this scribe? Vital & Urgent: See your state status & contact state officials! Conclusion: WAM has done the math and citizen action is urgent to stop this Compact! States where it has already passed add up to 171 Electoral Votes of the 270 required. 81 more Electoral Votes are at stake in states where NPV has passed 1 of the 2 needed chambers. Additionally, States where NPV is listed as currently active legislation hold more than 100 EV. There are under 100 total (electoral vote bearing states) more for this to be our law nationally – and there are way more than enough states with this in process to meet that end goal before 2012 Election!!! Shockingly, numerous Republican state officials have fallen for the popular vote strategy. Enough GOP have supported it, for NPV.com to brag this is a “bi-partisan” measure (along with bogus polls claiming how We the People want this!) Banners of progressive newspaper editorial endorsements are topped (of course) by the New York Times. Some GOP have co-sponsored this in their state. More have even voted for its passage! Whether these are ill-informed, popularity-seeking, bribed or just too dumb to do the math we can’t say. What we know is this probably means no more Republican presidents ever – and Obama back in 2012, if only by the tiniest of margins! Evidently, it’s going to take all of US to contact our own state assemblyman, state senator and governor to inform them of how destructive (and “progressive”) this national vote compact really is.